Part of the fun involved with buying a new lens is testing it out. Doesn’t matter how good or bad the device is, there’s “sweet spots” and contradictory failings which the itinerant wanderer needs to be familiar with if the thing is part of the daily carry. The B&H folks have a fairly generous return and exchange policy, and in my experience, the window in which you can hand them back the lens is a crucial interval for the investment. Accordingly, one has been shooting everything, and everywhere. I can tell you this, the sigma 50-100 is one hell of a portrait lens, but I’ve had unequal results in certain circumstances. My effort at the moment is to discover where and when those failings occur, rendering them predictable. One of the places this lens absolutely sings is in the dark. 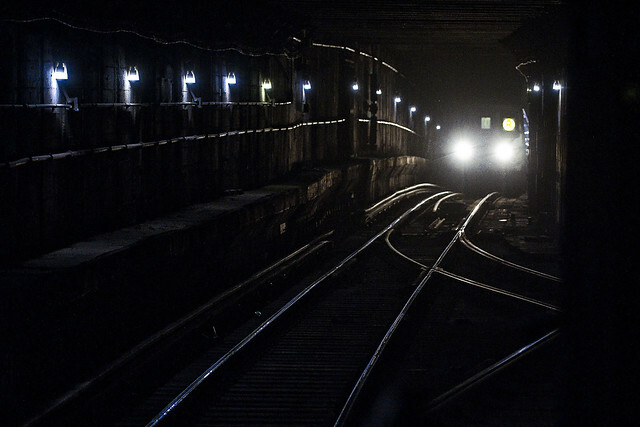 The shot above is “wide open” and was captured while I was waiting for the train at 59th street recently. 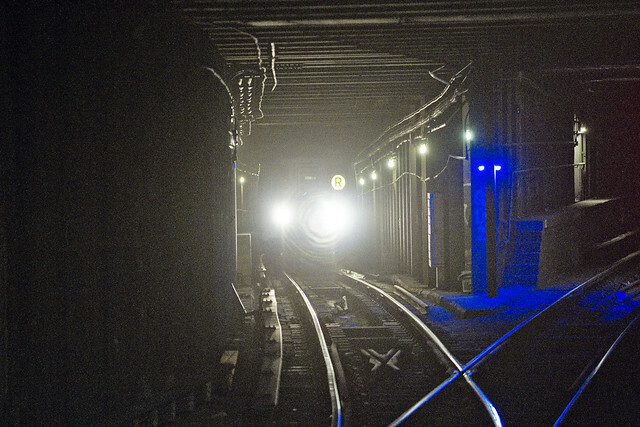 I’ve been saying it for a while, but the subway system is an absolutely fantastic photography workshop. Worst case scenario lighting, with a reflective subject moving at speed through darkness. 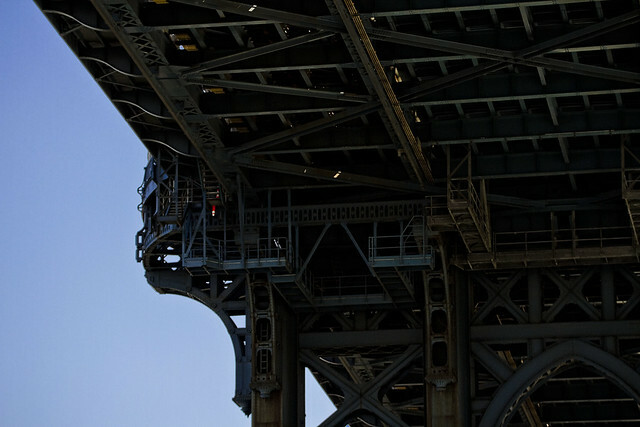 The shots above were captured at f2.2, with the lens dialed out to 94mm at ISO 5000. I’ve got a few other “bright lenses” but the sigma 50-100 really does a beautiful job drinking in the lurid shimmerings of pale light, and it literally outshines the other specimens in my “dark” kit. 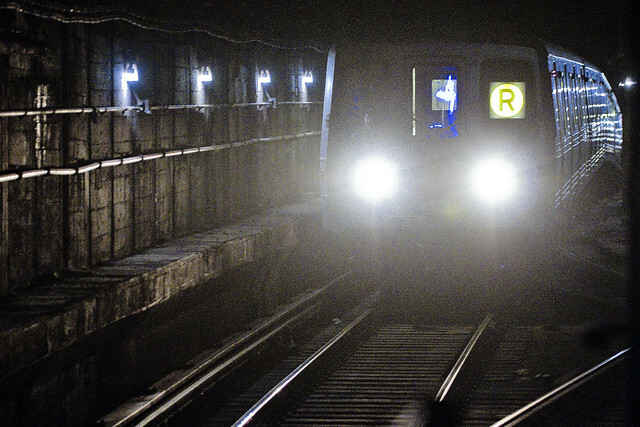 You can discern the lens’s aperture blades in the hot spots surrounding the R train’s headlights, incidentally. Shots like these subway images are dependent, in my experience on shooting posture. There are US Army sniper rifle manuals out there which discuss shooting postures, and the body posture process which riflemen use to steady and focus their fire on targets is quite appropriate for the capture of light through a lens, IMHO. From a different commute, the shot above was captured at Queens Plaza, and also depicts an R line train entering the station. There’s a bright, almost cartoony quality to the way that sigma’s “art” series lenses renders primary colors which required some adjusting on the saturation slider when I was working on the shot in Photoshop’s “camera raw” window. For those not in the know, RAW format is essentially an uncompressed digital negative which allows a great deal of fine tuning to the captured shot as the file contains ALL of the information which the sensor saw, whereas JPEG is an image which is compressed and all the decisions have been made for you by the camera. Those decisions include color temperature, depth of shadows/highlights and so on. Every RAW shot can therefore receive a bit of a tweak, and I always shoot in that format. One of the things I engage in when testing a lens is trying to push it to fail. Architectural detail does not work well with a wide open lens, due to the shallow depth of field. Even an infinity focus will produce unacceptable “bokeh” in this context, or at least it’s unacceptable to my eye. I want to see every rivet. 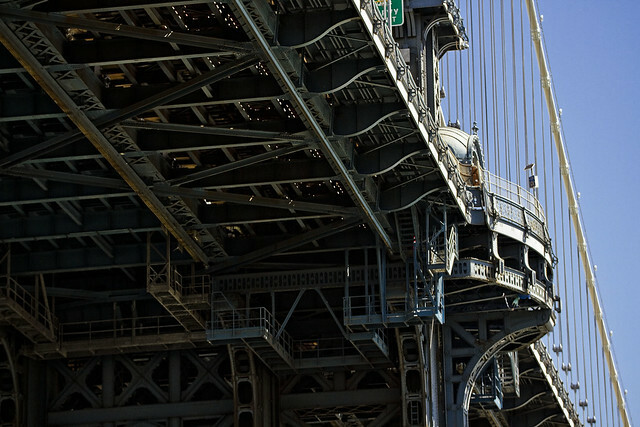 Saying that, the two shots of the Manhattan Bridge in today’s post were shot at f2.2 on a sunny afternoon. I think I’m going to keep this lens. I despise the term “bokeh”. It’s been bandied about since the late 1990’s I cut my teeth in photography using the term “shallow depth of field”.and “selective focus” And still use these terms. Now they talk about “pleasant” and “unpleasant” bokeh. It’s overkill and p-r e t e n t i o u s. It’s like discussing the ratio of metol and hydroquinone in film developers which was “all the rage”.amongst students of photography in the ’40’s to ’60’s. Concentrate more on good subject matter. BTW Some say that the independent lens manufacturers’ (Sigma, V\ivitar, Freaky-Flex, etc.) lenses are not as good as the camera manufacturers own lenses.